There is a lot of advice out there about how you should enter, develop and progress in nursing. Do you get your feet wet by simply gaining some “field” experience before transferring to a specialty like Emergency, Critical Care, or the Operating Room? What about pursuing an advanced degree? What are the qualities you should acquire and maintain to stay sharp? How do you avoid burnout? Where is the best place to work? What about workplace bullying? Nurses eat their young, right? The list is long and the questions are never-ending And, quite honestly, there is never a simple answer, or a single correct answer. Over the years, I think I’ve finally figured it out: I found that “one thing” that matters. I found that “one thing” that can ensure you don’t get bogged down with the rhetoric and negativity. What is it? Being honest is the key to success in this profession. And I’m talking global honesty across every facet of your job. If you don’t know something, admit it. It’s okay to share stories with them. It’s okay to be human. It’s nurses’ genuine nature that keeps patients voting us the most trusted profession every year. Don’t pull a fast one on the very people you’ll be relying on to pull you through that hellish shift. But don’t be a pushover. Be honest. Be genuine. You may be a little more vulnerable, but the reward you get always outweighs the risk. This goes hand-in-hand with coworker honesty. Take care of those who will take care of you. Even if it’s the worst boss in the world, hate and evil just beget more hate and evil. I truly believe that honesty always wins out. Respect has to be earned, not just expected. I have learned over the years to be honest about your skills, your knowledge and your performance with your physician partners–they will respect your honesty more than any lie you can tell. Don’t try to fool the very professionals who are your biggest supporters. Not happy with your job? Change it. Not happy with your position? Change it. Don’t let anyone convince you that your situation is not in your control. We work in the greatest profession I know. You have an unlimited number of opportunities–you just have to be enough of a forward-thinker to go find them. Be honest. Now, remember, I never said being honest was easy. Just because it’s the right thing to do doesn’t mean it’s popular. Be honest, but be strong. 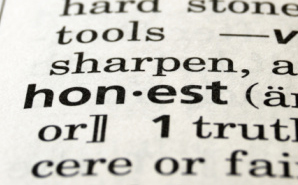 You will find that being honest is tough, so hang in there and don’t succumb to the pressure of dishonesty.